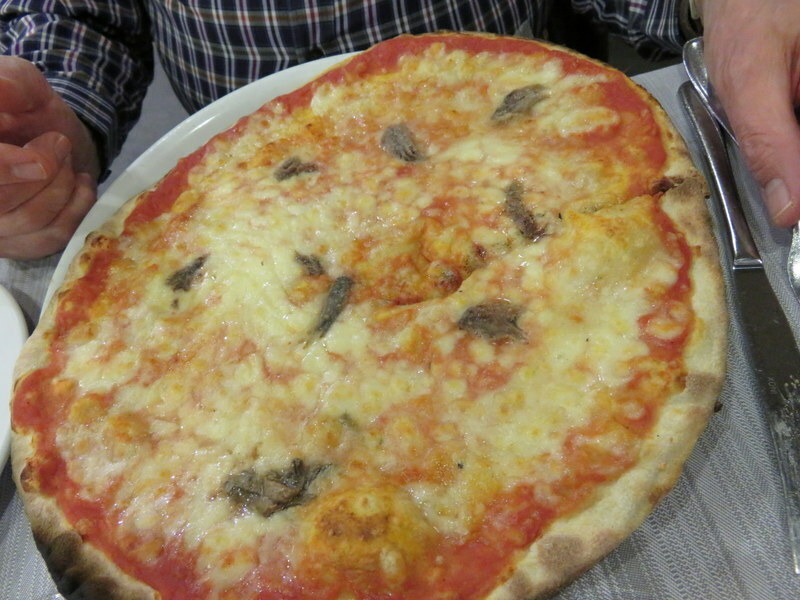 We had not been to Pizzeria San Marino in more than two years., but we recalled it fondly. It’s a long walk from our house — just short of an hour — but as we’d been quite lazy all day we needed some steps if we were going to eat pizza. 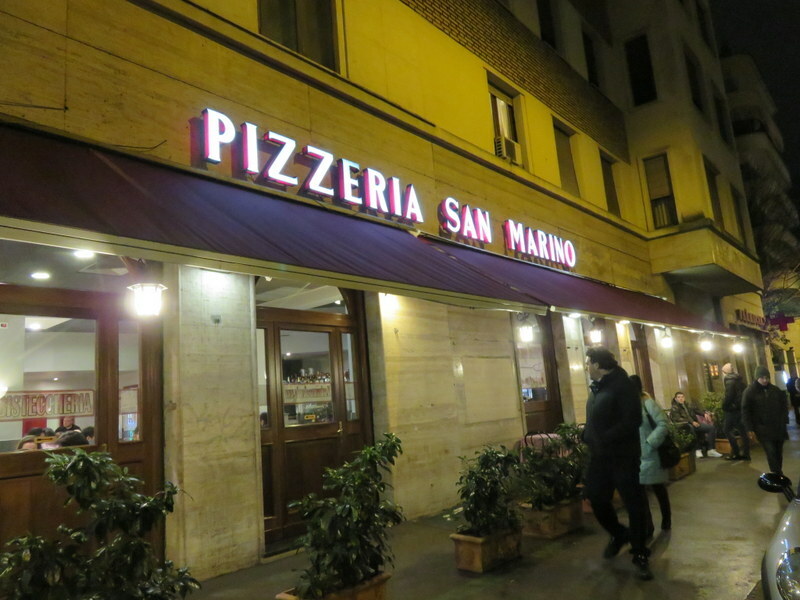 Pizzeria San Marino is on a busy street in the Trieste area of Rome. This is a cavernous place, outside of the tourist area, attracting lots of locals. We heard a mixture of Italian and English among young people at one table, otherwise, it was strictly an Italian conversation environment. I think one waitress did speak a little English. We arrived at 19:55, about 15 minutes ahead of a surge that completely filled the eatery by 20:30. This is good pizza and clearly has a following. Not the best we’ve ever eaten, but it’s tasty with a good-if-not-great crust (unlike last week’s disaster). The one fault was the sfizi. 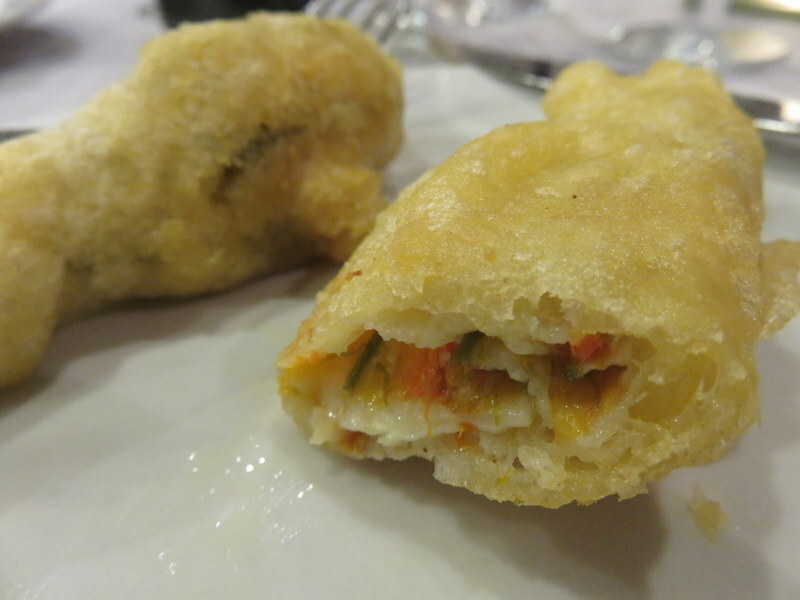 We ordered fiori di zucca, which are zucchini flowers stuffed with cheese and an anchovy, then battered and fried. They should be light, non-greasy, and too hot to eat. These were warmish, congealed, and heavy. Big fail. I think they’d been sitting under a warming lamp rather than freshly prepared. The bad news fiori di zucca. The pizza menu is large but features the usual suspects. Luckily our pizzas came out sizzling hot and flavorful. Pizza Quality: 2 Fresh and hot, made in a wood-fired oven. Although the red sauce was bland, the toppings were excellent and the crust held up well without being tough. Service: 3 Business-like waiters bustle about with no time to chat, but that does not mean they are are unpleasant. Clearly there are regular customers and these, as anywhere, get a little more personalized attention. Ric’s pizza Napoli. Nice scattering of anchovies and excellent cheese. Ambiance: 2 Cavernous room, somewhat noisy when full, but lively in a good way. My vegetarian pie. I would have preferred it with tomato sauce, not white. Large dining room, yet it is wise to reserve. There was a waiting line by 20:30. Clearly they do a lot of take-away business.